Award-Winning LIAWS members inspire kids to write. Award-winning children's book authors Yvonne Capitelli and Dr. Loraine Alderman, who are board members of the Long Island Authors and Writers Society, presented the workshop. "Our first Long Island Authors and Writers Society Children's Writing Workshop was a wonderful success. It is a joy to see children so excited about writing. Seeing confident smiles on their faces after writing their poems was fantastic. This is the entire reason we created LIAWS, to inspire writers of all ages," said Yvonne Capitelli, vice-president of LIAWS. 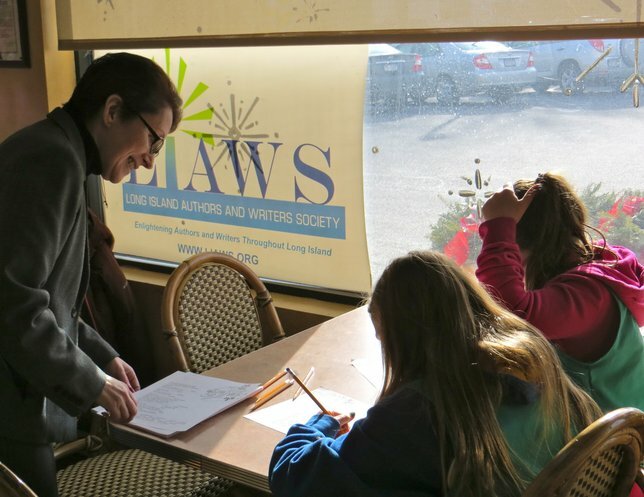 "This was the first of what will be many exciting events put on by Long Island Authors and Writers Society across Long Island for budding writers. LIAWS is experiencing tremendous growth. We look forward to mentoring and supporting writers and authors at all levels at different venues," said LIAWS president Tom Gahan. For more information on the Long Island Authors and Writers Society, or to download a membership application, visit www.LIAWS.org. The Long Island Authors and Writers Society is a not-for-profit organization dedicated to support and promote the craft of writing through supporting one another, mentoring its members, educational programs, in-school programs, book events and events related to writing, and community outreach to residents of Long Island interested in writing. LIAWS nurtures writers and authors at all levels of development in a mutually beneficial environment. LIAWS: provides a trusting atmosphere where authors and writers can come together to meet their individual needs and share information for the good of the whole, supplies strong motivational programs of interest to all writers, offers the opportunity for members to network on different levels according to their needs, provides an environment that promotes authors, and encourages writers to strive to publish their work. All members pledge to support one another and to be involved in supporting the activities of the organization. Subject: LongIsland.com - Your Name sent you Article details of "Long Island Authors and Writers Society Hold Successful Kid's Creative Writing Workshop"